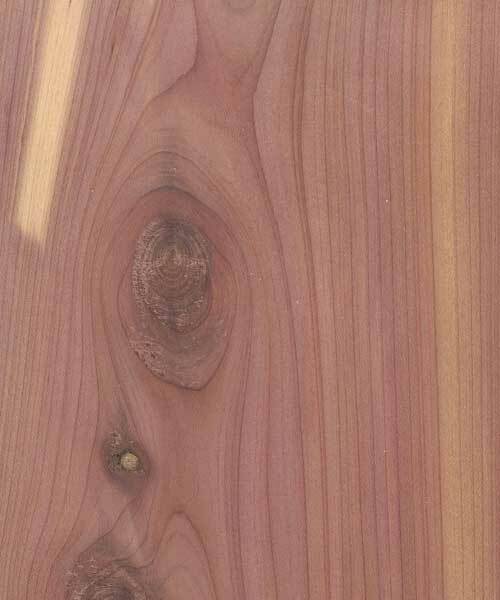 Aromatic Cedar plywood comes in 4′ x 8′ sheets available in 1/4 inch thickness. Aromatic Cedar plywood has heartwood tends to be a reddish or violet-brown. Sapwood is a pale yellow color, and can be appear throughout the heartwood as streaks and stripes. If you need sizes or grades of Aromatic Cedar plywood that we don’t stock contact us a call we can provide what your looking for! Highest quality veneer you can specify in any particular species. The veneer will be smooth, tight cut, and full length and free of any visible defects or abnormalities. An “A” face on hardwood plywood should be matched for both grain and color. All veneer splices should be book-matched for a visually pleasing appearance. There should not be any abrupt changes in color or grain between the splices. An “A” face will not permit sound knots, repaired knots or rough-cut veneer. An A face may allow slight mineral streak and/or vine marks. The number of defects such as pin knots or small burls varies according to the specie of veneer. This is the best face grade on plywood normally stocked and is often used for upper-end cabinetry, architectural millwork, and quality furniture. A “B” face on hardwood plywood should be matched for a pleasing color, but not necessarily for grain. “B” grade faces are generally very similar to “A” faces, but do allow some sound or repaired knots and some slight rough cut veneer. “B” grade faces will also allow slight mineral streak and vine marks. A “C” face on hardwood plywood allows for unlimited pin knots and small burls. A “C” face can also contain repaired knots and sound knots. The “C” grade will also allow unlimited mineral and vine marks. A “C” face should be a sound smooth face. A “C” face is used primarily on paint grade type panels, in lower-end case work, and for cabinet interiors in upper-end cabinetry. Can contain up to 16 sound tight knots not exceeding 3/8” in diameter. Allowed to contain unlimited mineral streaks. A “1” back will not contain any repaired knots. Can contain up to 16 sound tight knots not exceeding ¾” in diameter. A “2” back can also contain repaired knots, rough cut veneer, and unlimited mineral streak. This is generally referred to as a reject back. A “4” back is to be used in concealed areas where appearance is of no concern. The “4” back is most commonly used on 1/4” plywood. However, it may also be used on thicker panels when the back will. Particleboard is an engineered wood product manufactured from wood chips and a resin. Particleboard is a type of composite panel but it is made up of larger pieces of wood rather than fiber bundles as used in MDF. Particleboard also provides a smooth surface but does not have the strength of veneer core plywood. Because of the coarse nature of the particles, the edges must be treated in some fashion in the finished product. Typical PBC will have low levels of urea formaldehyde (CARB P2 compliant) but can be sourced with no added urea formaldehyde options as a core in decorative hardwood plywood construction. Veneer core is constructed with one or more layers of relatively thick veneers peeled from abundantly available species. These veneer layers (or plies) are laid up and balanced in alternating cross bands for stability and strength. Any decorative thin face of a wood species can be applied to the front and back of the panel. Compared to MDF and particleboard cores, veneer core offers strength, weight and screw-holding advantages. Medium Density Fiberboard is an engineered wood product made from wood fiber bundles and resin. MDF provides a smooth surface, but like particleboard it is denser and heavier than veneer core. Typical MDF will have low levels of urea formaldehyde (CARB P2 compliant), but can be sourced with no added urea formaldehyde options as a core in decorative hardwood plywood construction or separately as a raw panel. Pro Core utilizes veneer inner plies in all but those adjacent to the face and back. The outer plies are made of thin MDF to provide the panel with the smooth surface characteristics of MDF and particleboard but with less weight and improved strength. To learn more about plywood please visit our friends at Timber Products who have put together a useful documents page.